This delightful Window Pack comes neatly packaged with a matching box and ribbon. It contains a 60ml body scrub, 60ml body butter, 45g body soap and 2 x 6g bath fizzers. 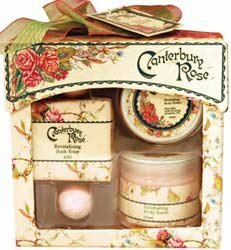 Canterbury Rose imparts a Damask rose fragrance with subtle green highlights and musk.